Precipitation (aka rain/snow/hail) are probably the primary factors at front of mind when planning a day in the hills, and checking the weather forecast will give indications of such. 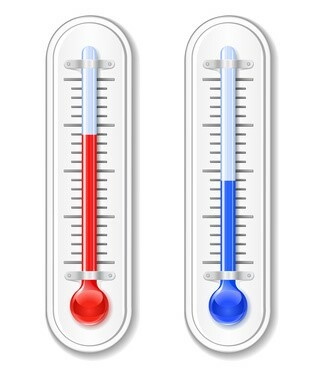 The anticipated temperature will also be shown, but there are a number of know-on factors associated with temperature. The ambient air temperature, as forecast, is what you'll feel on your skin. But when combined with wind, the temperature it feels like on exposed skin will be lower than the actual air temperature. This is referred to as wind chill, and is covered in a separate section. Air temperature is not the same at all altitudes. Whilst we'd all agree that the top of Mt Everest will be a very cold place, it's less obvious that at least one the reasons for Everest being cold is also a factor for UK mountain areas. Under normal atmospheric conditions, as altitude increases, air temperature drops between 1°C and 3°C for every 1,000ft (300m) height gained. For dry air the temperature drop is higher, saturated air the drop is more likely to be 1°C. In practice, this means that the temperature at the top of a 3,000ft (900m) mountain will be at least 3°C cooler than the valley, but could be up to 9°C colder! A good rule of thumb is to assume 2°C temperature drop per 1,000ft (300m). Given these average temperature drops, it's no wonder that some ill-equipped and inexperienced people get into difficulty on the mountains. We all know that water freezes at 0°C, so it's reasonable to assume that if the valley temperature is 6°c and you're heading to 3,000ft (900m), there is the possibility of ice at higher levels, especially in winter. There won't always be ice, but it's safer to assume in winter that there will be and equip yourself(s) accordingly, rather than take no account of the possibility and get into difficulty. Where there is likely to be ice, the recommendation is to carry winter kit, i.e. crampons and ice axe. An alternative to taking winter kit, especially where the whole group may not either have the kit or be skilled in using it, is to select a route that reaches lesser altitudes, i.e. where there is less chance of ice. Many mountain rescues are for lower leg injuries which are sustained through slipping on icy or wet ground. The Met Office have a good section on ice - find it here. If it's raining in the valley where the air temperature is 3°C, there is a good chance that it'll be snowing at 3,000ft (900m). The TV weather forecasts tend only to forecast snow at lower levels or give a passing mention to the possibility of snow on the mountains, which is why it's important to get as much detail as you can about the forecast for your planned route from specific mountain forecast sites. Hail tends be be short lived, but snow more sustained. Immediate dangers of being on the hill when it's snowing are more increased, and include: reduced vision, difficulty navigating and risk of avalanche, and are covered in more detail here. Where low temperatures and rain is forecast at low level (or show at high level), your choice of kit will be affected, with a pair of goggles being top of the list of additions. If the temperature is high, there are other risks. With the UK's climate being sometimes unpredictable, it's easy to neglect the effect of heat. Taking extra water, sun cream, sunglasses and a baseball cap can all lessen the impact of excessive heat. If walking with a group in hot weather, it may be advisable to take a couple of sachets of re-hydration salts. When there's a covering of snow, it's particularly important to wear sunglasses or goggles, as dangerous UV light is reflected by snow even when there's a cloud cover.